Although Bedfordshire is one of England's smallest counties it accommodates some of its loveliest rural landscapes, including many fine market towns and several magnificent stately homes. Located within the London commuter belt, Bedfordshire is still very much in-touch with its agricultural roots, and is famed as the birthplace or one of England's first modern petrol driven tractors, the Ivel. The Ivel tractor was developed in 1902 by Daniel Albone, who named it after one of the county's rivers. 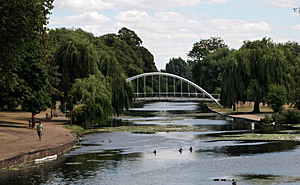 South Bedfordshire is characterised by the chalk hills of the Chilterns and the valleys of the River Great Ouse. This area has strong associations with John Bunyan the author of The Pilgrims Progress, which is set in the rolling downs of the Chilterns. Bedfordshire boasts a wide range of interesting places to visit. If you enjoy nature and wildlife then Wipsnade Park Zoo is an ideal destination, where more than 2000 animals roam free. There is also an animal kingdom at Woburn Abbey, plus the headquarters of the RSPB (Royal Society for the Protection of Birds) based in Sandy. Daniel Defoe (1724), "Tour Through the Whole Island of Great Britain"
Bedfordshire Clanger - pasty with savoury filling at one end and a sweet at the other. Bedfordshire Wigs - round, spongy gingerbread cakes. The thick rim resembled the curl of a Georgian wig. First recorded in 1011 as "Bedanfordscir". Meaning the shire or county of Beda's river crossing.